The Obama campaign has decided to run a poster contest. 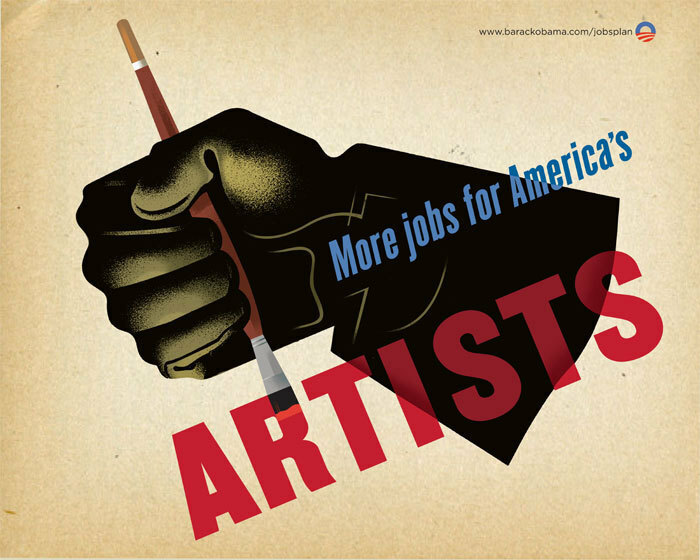 Some artists see this as a high form of irony, considering the posters are intended to promote jobs in America. Some artists see it as a volunteer opportunity to give something to a cause they believe in. I don't like contests or spec work for artists; especially contests like this that require the artist to give up the copyright to the image by submitting the work. How about giving the poster assignment to twenty great artists and offering them a fair fee for their work? Create twenty freelance jobs. Shovel-ready. Get twenty great designs, sell prints online, and raise awareness of the President's Jobs Plan. That hand poster has been ripped off so many times it's not funny. To demand others treat you with respect, first you must respect yourself. Unfortunately, as long as there is someone out there willing to underbid on a job, or give their work away, it will remain impossible to demand that our work be valued. Couldn't agree more, Paul. I was surprised to see the Administration was doing this--it seems tone-deaf in the extreme. Glad to see your post. I have a jobs plan here at O'Brien Illustration. It involves working and billing my clients and paying my bills. I hatched that scheme back in 1987. Oh, and I pay my taxes...all of them. Looking south, is that pot starting to boil? Occupy a living wage? Thanks for the the inspiration and for volunteering! Money for Work. Pretty simple concept. Maybe a poster slogan. Why don't they just let Shephard Fairey do it.